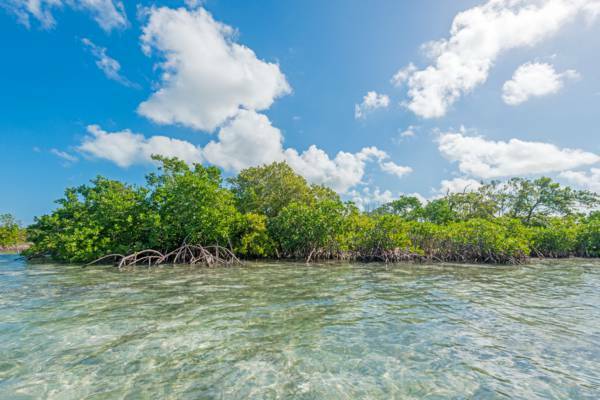 The mangroves of Major Hill Cay. Part of the East Bay Islands National Park and in the general Bottle Creek area, this small low lying uninhabited island is found close off of North Caicos. Consisting mainly of wetlands, there are no beaches to speak of. Total land mass is about 240 acres (97 hectare), but not all of this is dry at high tide. The sheltered channel that separates Major Hill Cay from North Caicos offers great kayaking, as it’s protected from the regular east southeast trade winds. As in all protected areas in the Turks and Caicos, It is illegal to take or harm any animal, plant, natural item or historical artifact. This includes seashells, animals, plants and flowers, coral and sand. Littering and vandalism is against the law and punishable by fines and/or imprisonment. Major Hill Cay consists of a combination of mangrove wetlands and low elevation sandy brushlands. Last reviewed by an editor on 16 May 2016.